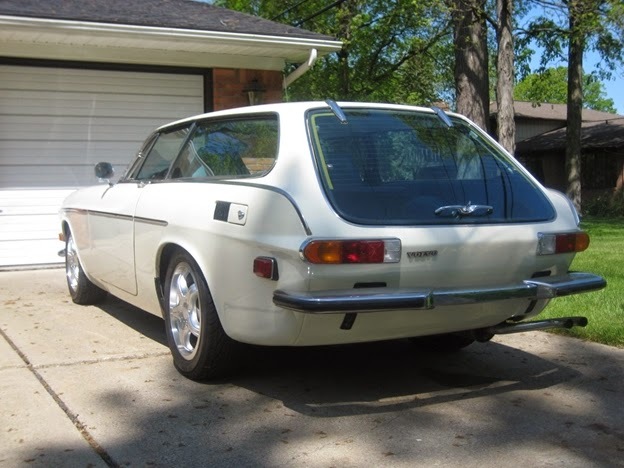 Hello to the Daily Turismo collective, Today I have made an executive decision to sell my 1973 Volvo 1800ES. The CEO (wife) has rubber stamped my next automotive life direction. The price is $4500. I believe it is a SUPER deal compared to what I have seen in the market place. I always wanted to restomod a Volvo 1800ES ever since high school. It was not as nice as I thought, but none the less it was a solid car to modify and it would present well as the project evolved. When I first got the car I drove it around the neighborhood to get a feel for it. The performance and steering was underwhelming. (Being an automatic didn’t help) So to me a mechanical restomod was the only way to get started. Then out of the blue came Robert Jackson of Swedish Ops on the 1800 email list. He was developing Mustang II bolt on front suspension kits with all the goodies to fit 1800’s. Big disc brakes, coil overs, quick ratio rack & pinion, etc. I am all excited since I do not have a welder and I figure let someone else work out all the bugs. Of course I immediately sent a big check! Wow I thought, now let’s start shopping for a crashed 3.7 Mustang V6 stickshift! I should be able to make fast progress. Then all I got was crickets and very creative stories from Robert over the years while my 1800ES sat on car ramps. It seems I was not alone and the case is now in the Oklahoma Attorney General hands. So my automotive life over the past 5 years was relegated to maintaining my 136hp 1987 Audi 5000S Quattro, 110hp 1984 Audi 5000S automatic Avant, and the wife’s 88hp 1976 Mustang II. I can’t even beat a rental Versa at the track! So I had my 60th birthday and decided I had better get my automotive life in order. So I started researching alternative front suspensions that I could adapt to the 1800ES including many of the Mustang II manufacturers. The Swedish Ops Mustang II suspension is no magic, they are just a couple plates welded to someone’s aftermarket kit. Anyway I was leaning towards a Miata front suspension to get improved geometry over the Mustang II suspension. Then I realized everything I was planning to accomplish still would not equal a Miata. So I just bought a turbo Miata. Miata is the answer after all! So I will need to free up a garage spot since I have five vehicles and the Miata would be the sixth. In pictures my 1800ES looks like a $25,000 plus vehicle, but it is not. So that is why I am asking a very low price so the next owner will be satisfied with their purchase. I hope any potential buyer will stop by to inspect the vehicle first. I will take more pictures this weekend and post a Craigslist ad. For now all I have are these pictures from a few years ago. The car cannot be driven as it has some maintenance needs from the previous owner and from sitting. I have not done anything to the car except change the oil and transmission fluid for its storage. I have done a quick survey of what it needs. I say 3 long weekends of simple work and it could be a nice driver or God forbid a flipper. · Rear calipers and flex brake lines – The rear calipers drag after the first application and get worse as they heat up. · Fuel - The old gas must be drained. It smelled bad when I got the car 5 years ago! · Electric fuel pump – Mounts are broken and gas leaks somewhere near the pump. · Engine – The previous seller said the engine was recently rebuilt. So the valves should be adjusted as they have probably seated in. The ignition parts should be changed. I have some of the ignition parts. · Electronics – The engine ran rich when warmed up. Needs the coolant sensor changed and new electrical connector. I have these parts. I also have a set of fuel injection points. · Cooling system – The radiator was leaking. Plan to change the radiator, thermostat, and all hoses. · Rear end – I would change the fluid. The fluid could be very old. · Transmission leaks when sitting – I think it need the shift lever seal. I suspect the trans-cooler fills back into the pan when sitting and raises the fluid level. The previous owner claims the transmission was rebuilt. It looks nice however I have no documentation. 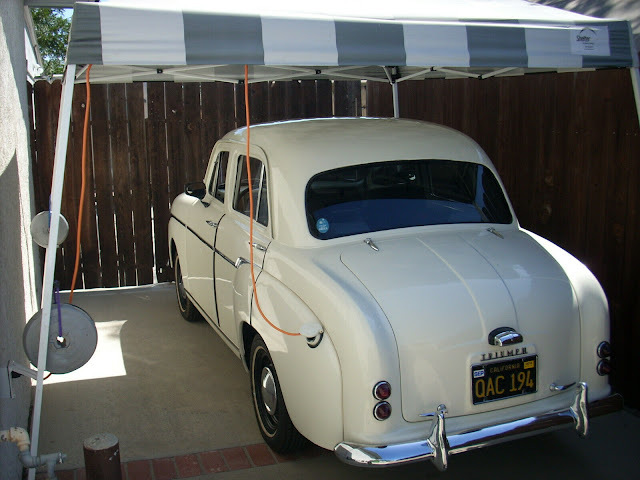 · Hood – check hood lever adjustments. The hood does not lift high enough to grab it. · Steering gearbox – check fluid level. · Battery – Needs a battery and the battery box replaced. · Body – Has some body filler here and there and has been painted. The front lower pan is wavy. A few bubbles are behind the front wheel. The frame jack pad and undercarriage is in very good condition. Purchased from Washington. Interior – Seats have been redone. Headliner is nice. I would suggest adding some POR15 around the rear window seal area. Maybe I'm missing it but I've read the ad twice now and still don't see where the car is located? If anyone needs additional pictures or information they can email me. It may be difficult to get good pictures until the weekend since it starts to get dark by the time I get home from work. It doesn't help that I have a 53 mile commute and I am driving the wife's Mustang II this week with old unbalanced tires. It only likes being under 62 miles per hour! I think that those cars are overrated (heavy and slow with a useless back seat). But they are very interesting and that's a hell of a price. Despite my reservations, I'd jump on it if it was closer. Nothing can match the part-count-per-HP ratio of a mid '80s Audi 5000 automatic. Thanks Rene C for offering it up here first. Really nice car and great price. Someone is going to be stoked. Rene, I'm truly bummed for you, brother. Despite your Miata epiphany, I can't help but think that if Swedish Ops hadn't been the complete, utter, indisputable DB that he is you would have not lost your drive and I would be looking at your car for inspiration. One fewer coffin cruiser sours my disposition a bit, but I know I can go to you when I have questions regarding my own. Best of luck with your sale, Rene. Thanks for the kind words doctordel. I figured it would take me at least two summers to take the 1800ES in another direction with my busy work schedule. So changing to the Miata brought the timeline in dramatically. I sure will miss glancing back at the lines of the 1800ES just like looking at a passing beautiful women. We do refer to our cars as "she" don't we? Keep me updated on your project. I still will keep my 1800 interests alive. Nice car and best of luck! I hope it finds a really good home, like yours. Question - what sort of exhaust is on it? Those are some cool looking pipes. E-mail sent to you. Another Michigan 1800 owner would like to talk to you. Special thanks to Daily Turismo for the Exclusive. I have had many inquiries. +1! I hope he buys it! Those are indeed some cool pipes. I didn't know they were stock like that. I've never even driven a 1800ES. What Mazda? I purchased a turbo Miata for the twisties and the track while I still have my reflexes. This will replace my Volvo 1800ES that should have been that car. Coolio! Something we have in common, but mine has a JRSC. What year? Fixed the gas leak, threw in an old battery, put in some premium fuel in the gas tank, and got it started! Motor sounds real good. So it can be moved under it's own power for a very short distance until the brakes start dragging or it starts running rich as it warms up.